I love this video. I laughed my head off! Most of you know that I am a bit on the kooky side. I'm into healthy/organic foods, I home birth my babies, I plan on home schooling, etc....Well, if you didn't think I was kooky before then you will surely be convinced after this blog posting. I have found a new degree of kookiness to explore and I'm loving it. A couple of weeks ago I called my sister to ask her to "test" me. She has been practicing it for a little while and I wanted her to do it because I didn't trust myself and I wanted to get it right. I waited a week for her to be able to sit down and actually take this upon herself. The results were so amazing. 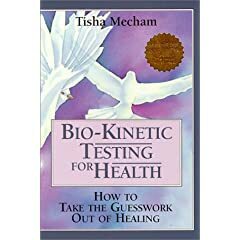 I now know exactly the things that are wrong with me (which are many and I knew there were many when I went into this) and how to fix them via herbs and supplements. She told me some very acurate things that she couldn't have known and I know I haven't told her. For instance, strangely enough my allergies are affecting my ears. Now I know why my ears have been itching a lot and why I sometimes get a strange pain in them. Makes total sense. She also said I had a virus in my stomach. Sure did but she didn't know that. I could go on and on. So long story short, I have been on my herbs (which by the way you can test for which ones you needs and how much etc...)for a week now and am feeling so much better. I won't go into the details of all the things I need to fix but I will tell you that through my own testing I am improving day by day. I know it sounds weird. It sounded weird to me too but now I have to say I am totally convinced and am working on my own testing abilities so that I can help myself and my family. I am a true believer that people should take more responsibility for their own health instead of running to the doctor every time they have a sniffle. Not that I don't believe in doctors, I think they are important for a lot of things but not for everything. There are so many things that we can do to take care of ourselves. I also believe that herbs were placed on this earth for that specific reason. Yes, conventional medicine has it's place but so do the things that God himself has provided us with. I have to give you an example of how this whole testing thing has helped a good friend of mine. (I hope she doesn't mind me using her as an example) We'll call her Mary. 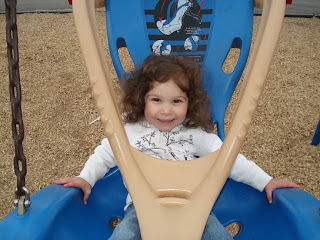 Mary has had Epstein-Barr virus (which is actually very common) for 6 years. She was diagnosed by a doctor and told pretty much that there was nothing they could do for her, it was going to be her lot in life to be sick and tired all the time. Her immune system was so weak that any little cold her kids had would turn into serious issues for her, including having pneumonia. She was tired all the time and had said she wouldn't have anymore kids because of her tiredness and inability to take care of another baby. Anyway, she got tested, got on a special diet and some herbs and after about a month she was feeling so much better that she says she could even have more kids. She says she hasn't felt this good in 6 years. Where conventional medicine failed her, herbs and diet helped. I know most of you probably don't believe in going all natural and perhaps are even afraid of herbs but I have to tell you for the record, they work. I guess you could say I have kind of gained a testimony of them. (hopefully that doesn't sound sac religious)Not only through this experience but over the past 4 years as I've seen how I have benefited from knowing what natural things to do for my health and the health of my family. I am actually so grateful to have this knowledge now and I know that my family will benefit from it. I would totally recommend reading this book and studying it out for yourself. You won't be sorry. I haven't posted any pictures of the girls in so long I thought it was high time I did so. 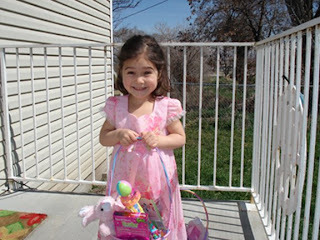 Here are a few from Easter and a day at the park. Enjoy. Aliases: "Bupany" "Buppy" and "Bupity bup"
Who knew such a cute little innocent looking bear could cause so much trouble. When I was pregnant with Sofi, Lili and I went on a little shopping trip for her soon to be sibling. We didn't know whether she would have a brother or sister so we picked this little bear. He turned out to be Sofi's lovey. She will not sleep without him and if she wants him and can't find him she cries and screams and carries on until we find him for her. I have become obsessed with this bear. I am always very very conscious of where he is especially if he goes out of the house. I know that my life would turn into a living hell if ever he were to be lost. This was made quite evident during our move a couple of weeks ago. Even though we were only going for a short hour and a half ride I knew she would want him. We were all ready to go and loaded up when I realized we didn't have the infamous "Bup". So like I said, my life was a living hell for an hour and 20 minutes. Somehow "Bup" had been inadvertently packed up in the big truck so we had to brave the journey without him. And a rough ride it was indeed. 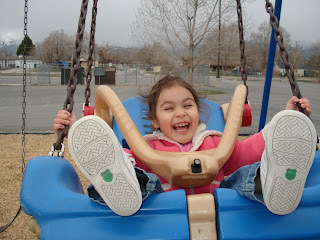 Of course, I was the only one who had to endure as Lili had ridden with daddy in the big truck. Sofi screamed (and I mean screamed) and cried and screamed and cried the whole way. It was miserable. Luckily he was found quickly after arriving at our new place. Phew! A couple of days ago we went to my sisters to play. Of course "Bup" was with us. He was in my plain sight most of the day but nearing the end of our stay Sofi disappeared with him. She wandered upstairs without me knowing and was getting into all kinds of things. The first time I found her she had chocolate all over her face. 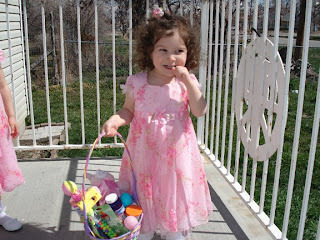 She had found her cousin's leftover Easter candy. The second time I found her she had what appeared to be concealer all over her lips. She had apparently thought it was lip gloss. None the less, she had invaded her older cousins room much to my dismay. After that it was definitely time to go. I cleaned her up, loaded the girls in the car and drove off. After a few blocks I realized that we didn't have "Bup". So we turned around and I went in search. I searched for about 10 minutes and then decided I would just have to come back after dinner. Search I did. For over an hour. I looked outside, inside, going room by room looking under everything. No Bup. I was very very stressed out. It was nearing bedtime and no Bup. What on earth would we do? I cried, I prayed and still I couldn't find him. I started to imagine that he was lost forever and it actually made me sad. I was really really quite sad over the loss of this little inanimate bear. Finally I called my hubby and told him to bring the girls so we could all look for Bup. As soon as they arrived I took Sofi Upstairs and told her to find Bup. She lead me right to him. All of that stress for nothing really. If I had just had her look in the first place ....duh. Well, luckily at least he was found and we can all rest easier knowing that he is home safe and sound. Funny thing is, I realized that perhaps I have my own feelings of attachment to Buppy. I actually kind of love him too. He has somehow made himself a big part of our family that will one day be missed when Sofi is too old for him. I'm wondering if any of my friends feel a need to head out of the city and go for a ride to the country for a day. I fear I may become quite lonely and perhaps even go berserk. My van is broken. Sad sad day for me. We knew it was coming, the starter has been acting up for a long time but since we never had any money to fix it we just prayed it would keep working for us and it did.....until Sunday. It would not start for us and consequently we were nearly late for church. Lucky for us they run on Mormon standard time here. We all piled into "little red" ,the girls without their car seats no less, and drove our little country bumpkin selves to the church 6 blocks away. Good thing church was so close and that we do live in a place with absolutely no traffic. Anywho, we still lack the fundage to fix our van (partly because Ivan had to take 3 days off last week to go to an interview in Kansas City) so I just might go crazy being stuck in Grantsville for the next few weeks until we can get it fixed. Oh, and if any of my friends feel like hosting a Stampin' Up! party for me so I can earn some extra cash to fix my van then I would greatly appreciate that as well. =) (except you might have to come pick me up =) ).